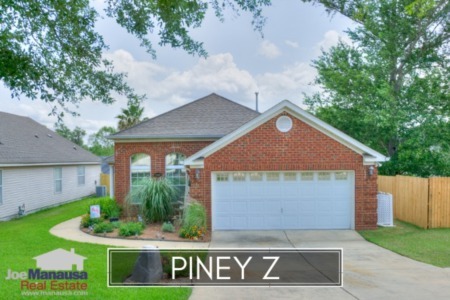 Located on the NE side of Tallahassee on the NE Bend of Conner Blvd., Piney Z offers three and four bedroom homes in a super-convenient location by Tom Brown Park and Lincoln High School. Many people choose this neighborhood for the amenities that "come with" the neighborhood. Access to parks, lakes, pools, and a lodge brings a lot of bang for the buck for people who choose to call Piney Z home. 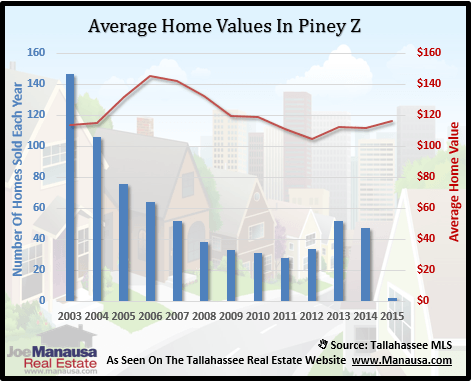 In this report, we will look at prices, values, and sizes of homes in Piney Z, as well as show current listings in the Tallahassee MLS and all closed home sales going back to 2003. Piney Z is a neighborhood full of amenities, including the Lodge, Swimming Pool, Fitness Center, Pavilion, Playground and Gazebo Park, and various common areas. Find out about all these and more on the website for Piney-Z Homeowners Association and Community Development District. For every real estate graph found in this report, you will find the number of closed home sales for each year (blue columns, measured on the left vertical axis), and an important real estate statistic shown in red (measured on the right vertical axis. It is important to note that sales are through December for all previous years, but through mid December in 2014. Average home prices have dipped 4% in 2014 versus 2013, and still sit well below the peak of the market prices established in 2006. 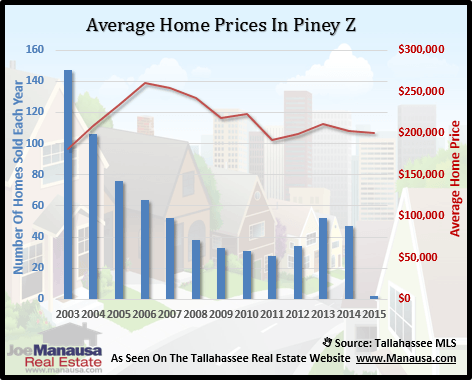 Distressed sales are are occurring at a rate consistent with what other neighborhoods in Tallahassee are seeing, which is definitely having an impact on the average prices. 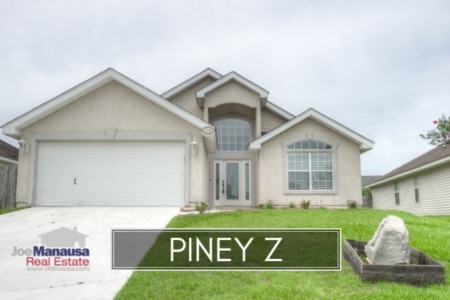 The average recorded sales price is $202,700 for Piney Z thus far in 2014. Home sales activity this year is stronger than we have seen over the past seven years (with the exception of 2013), but still well below the levels recorded during the most active years from 2002 through 2006. Thus far in 2014, there have been 41 closed home sales in Piney Z. Average home values in Piney Z have fallen just 1% since last year, after having recovered nicely last year from the low set back in 2012. Through November, the average value of a home sold in Piney Z has been $112 per square foot. This is up 7% over the bottom reached in 2012, but still down about 23% from the market high set back in 2006. This means that many homeowners who have purchased or refinanced in the past 10 years are likely at zero or negative equity situations. 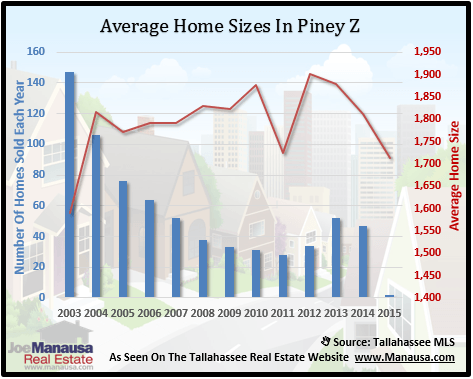 The average home size sold in Piney Z typically falls in a range of 1,700 to 1,900 square feet, and this year buyers have been selecting the homes right in the middle of this range. The 41 sales thus far in 2014 have averaged 1,812 square feet. The following list of homes are the most recent listings in Piney Z. A red box will appear when no homes are listed for sale in the Tallahassee MLS, but check back again on a regular basis as this page updates twice daily. The following list shows home sales going back to 2003 in Piney Z.
I hope you enjoyed our November 2014 update on home sales in Piney Z, please feel free to drop me a note if you have questions not covered in this report.